Celtic have signed Japanese midfielder Koki Mizuno on a three-and-a-half year contract with Georgios Samaras agreeing a loan deal from Manchester City. Mizuno, capped three times, joins Celtic from J-League side JEF United while Samaras has signed up for the remainder of the season. 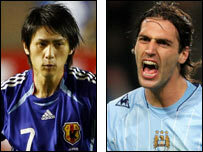 The 22-year-old Mizuno joins his fellow countryman Shunsuke Nakamura with the Scottish champions. Celtic have the option of making Greek striker Samaras' deal permanent. Mizuno has won youth international honours for Japan, gaining his first full cap in March 2007 in a friendly against Peru, before winnng a further two caps in last year's Asian Cup. Samaras, 22, meanwhile, has been out of favour at the City of Manchester Stadium, signalling Hoops' boss Gordon Strachan's move. "I'm really delighted," the 22-year-old told the club website. What do you think of the new Celtic signings? "It's the biggest club in Scotland and I'm looking forward to winning games and to win the title we have targeted. "I'm here to help the team and to reach the targets you have. "Of course, a big team like Celtic wants to win everything and I'm here to do that to win everything. And with Euro 2008 on the horizon, he believes his ambition of playing for his country could be boosted by making the move to the Scottish Premier League champions. "One of the reasons I signed here is because I will use the games to help Celtic, and, of course, for the chance to be in the squad for the national team of Greece for the summer. "I'm here to help Celtic and for Celtic to help me." Samaras was signed by City boss Stuart Pearce for £6m in January 2006 from Heerenveen, after an impressive 25 goals in 31 starts for the Dutch side. 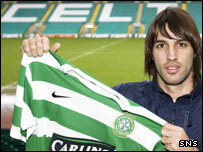 Capped 12 times, the forward had previously been linked with moves to Rangers, Bolton, Middlesbrough, and Espanyol. Meanwhile, Celtic have confirmed their interest in the £3m-rated Burnley striker Kyle Lafferty. However, if the Glasgow club fail to clinch his signature in this transfer window, then they could return for the Northern Ireland international in the summer.